Our Smart Peg Clothes Pins is OUT OF STOCK, but we have ordered more! You are still able to purchase it now and we will ship it to you as soon as it arrives. Questions? Please call 1-800-438-5346 or email us at info@Lehmans.com. These pins raised ridges give more gripping power. 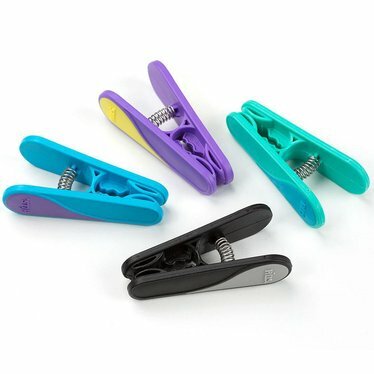 Smart Pegs® are made of dual molded thermoplastic rubber. Best Pins I've ever used. These are truly the best clothes pins I've ever used. No problems at all. But I don't live in winter bitter cold climate that could cause them to break like previous review. I do live on the west coast and we are currently having extreme high heat of 109 degrees. This is the perfect clothes drying weather and these pins hold up just perfect. In fact I'm ordering another set for a friend. Terrible product looks great but they fail very quickly....break in the middle fine plastic, Did not even last 12 months. Go back to wooden pegs & save yourself a lot of money! Love these pins, they hold really well. Like these clothespins but they are not good to use in cold weather. They break in the middle easily. My hands are stiff sometimes but these are so easy to handle. Hope they don't snap so easily when it warms up.